James Whiting joined the colours at the start of the First World War and served with the Duke of Edinburgh’s (Wiltshire Regiment) before being killed in action in April 1917. He had previously been awarded the Military Medal. The information on James Whiting has been compiled from a number of sources, including the Commonwealth War Graves Commission, from the Labour Voice newspaper, and the Parish Burial Register (courtesy of the Swansea Archives). 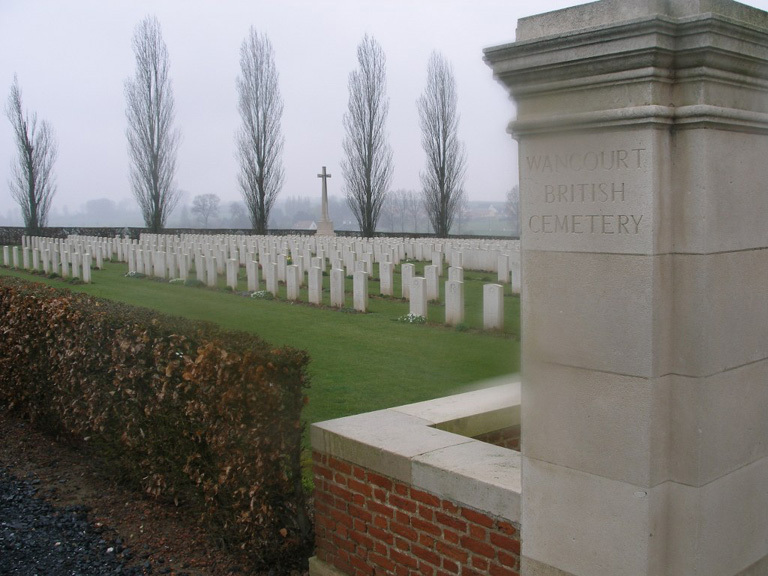 Cemetery WANCOURT BRITISH CEMETERY - FRANCE;VI. E. 24. Memorial St. Andrews Church Chedworth / Chedworth (Lower) This war memorial was originally dedicated in July 1920 at the former Congregational Chapel. It was rededicated in July 1996 and also serves as a commemoration of the Chapel community, its Chapel and the Old Manse. Family Details Son of Frederick Henry (born Gloucestershire 1857) and Mary A. Whiting, nee Day, (born Chedworth Gloucestershire) of Queen Street Chedworth Glos. 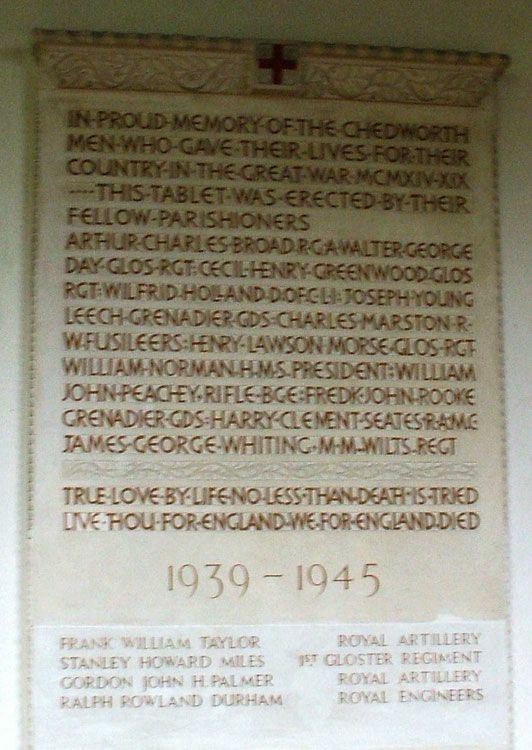 To the left is the War Memorial in Chedworth Church, Gloucestershire, showing that James George Whiting is listed upon it as one of the First World War fallen. His sister Ellen (Helen Martha) married John Harry Dyer in Hampshire 1901. She had two children Harry (born 1907) and Ivy Elizabeth (born 1909). By 1910 the family had moved to the Swansea Valley but John Harry Dyer died 1910 and Ellen resided at the Old Shop Abercrave with her children and sister Annie, now a dressmaker. News has at last come to hand respecting Pte. James Whiting, who is serving at the front with his regiment: one of the Wiltshire Battalions. No message had been received from him for some time, but last week-end it came stating that he had been twice wounded in the fighting, the first time not seriously, but the second time, we regret to say, badly, and he is now being treated in hospital. We hope he may have a speedy recovery. Private James Whiting a well known local resident, who has been out in France with his regiment almost since the commencement of the war, came home on furlough for the first time on Monday. Private Whiting was a reservist called up at the beginning of the war and he proceeded to the front almost immediately afterwards. He has been twice wounded. Private Whiting has two sisters living in the Old Shop, one being Mrs Murphy, with whom he stays. It will be remembered that in pre war days, Private Whiting was assistant master of the local troop of boy scouts. Corporal James G Whiting of the Wiltshire Regiment has been awarded the Military Medal for bravery on the field. He is a son of Mr F Whiting, builder of Chedworth Gloucestershire, who is at present engaged on Government work near Carlisle. His brother Sergeant Alfred Whiting, South Wales Borderers, is also serving in France. Corporal Whiting was called up at the outbreak of war and his brother was one of the first volunteers from Abercrave. Both were working at the Gwaunclawdd Colliery Abercrave and resided at Gamlas Cottage Abercrave. The death occurred on Thursday last of Miss Annie Whiting Old Shop. Deceased, who was 32 years of age, had been suffering for the last 12 months during which time she underwent an operation. The funeral took place on Monday afternoon at St. David’s Church the Rev James Jones (Rector of Ystradgynlais) officiating. Two of her brothers, Privates James and Richard Whiting, South Wales Borderers, two members of the Abercrave Athletic Association, are fighting in Flanders and were unable to be present. On Saturday morning a telegram was received by Mrs. J. Murphy, Old Shop, with the sad news of the death of her brother, Private James Whiting, Wiltshire Regiment, who died of wounds in one of the base hospitals in Flanders. Private Whiting joined the colours at the commencement of war and visited his sister, with whom he resided a few months ago, looking in excellent condition, and was given a hearty reception by all his friends. Another brother Richard Whiting is also at the front. Private Whiting undertook the duties of scout instructor prior to his enlistment. Great sympathy is felt with the relatives in their loss.